Savvy Entertainment will bring music industry executive, author and philanthropist Shanti Das to the island as part of her mental health awareness initiative – Silence the Shame. A spokesperson said, “Ms. Das started Silence the Shame under Hip-Hop Professional Foundation, an organisation she founded. “Ms. Das has been at the forefront of the US music industry for more than 20 years. Straight out of college she became national Director of Promotions for LaFace Records and, since then, has lead the marketing divisions of Arista and Universal Motown and is currently the owner of Press Reset Entertainment. “She has suffered from depression for a number of years and has experienced the impact mental illness has had on some of her close friends and family members. This exposure led her to create Silence the Shame, a programme to encourage and spark discussion around mental health disorders. “Her aim is to peel off the layers of shame associated with having a mental health illness, exposing the fear and misconceptions that lie beneath, and then educating communities so that the misconceptions are righted. When this happens shame is dropped – silenced. “September is Suicide Awareness Month and we felt it fitting to round out the month with this worldwide awareness initiative .We are pleased to bring Shanti Das to Bermuda so that we all can share in the Silence the Shame initiative,” said Savvy Entertainment Chief Operating Officer, Danilee Trott. Preston Swan, BHB VP Quality and Risk Management, said, “The general public tend not to realize that mental illness affects a significant number of people in the community, many of whom are able to learn to cope and manage their condition. 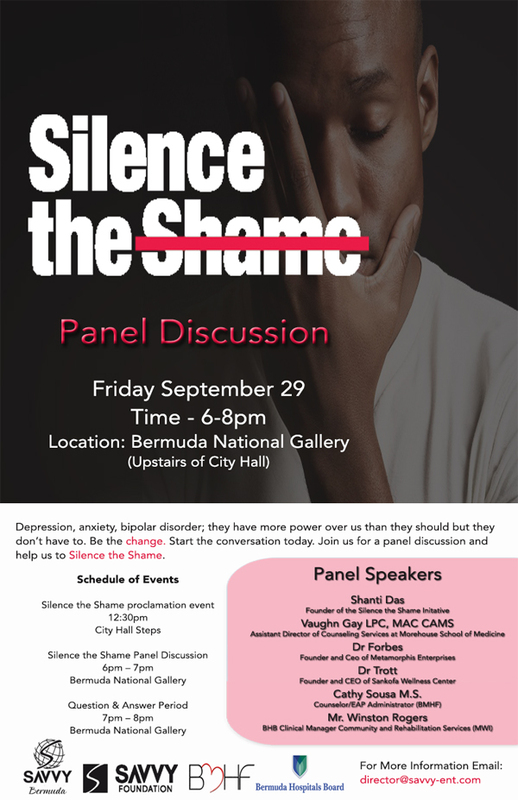 “On, Friday September 29th, Savvy Entertainment will be hosting a Silence the Shame Proclamation on City Hall Steps at 12:30pm as well as a Silence the Shame Panel Discussion at 6:00pm at the Bermuda National Gallery. “Panelists include Ms. Das, Vaughn Gray, Assistant Director of Counselling Service, Morehouse University School of Medicine; Dr Khaalida T Forbes, Founder and CEO of Metamorphosis Enterprises; Dr Larry Trott, Founder and CEO of Sankofa Wellness Center; Cathy Sousa, counsellor and member of Bermuda Mental Health Foundation; and Winston Rogers, BHB Clinical Manager Community & Rehabilitation Services, Mid-Atlantic Wellness Institute. “Both the proclamation and the panel discussion are free and open to the public. “While Shanti Das is on the island, Savvy Entertainment has arranged to host Savvy Sessions. 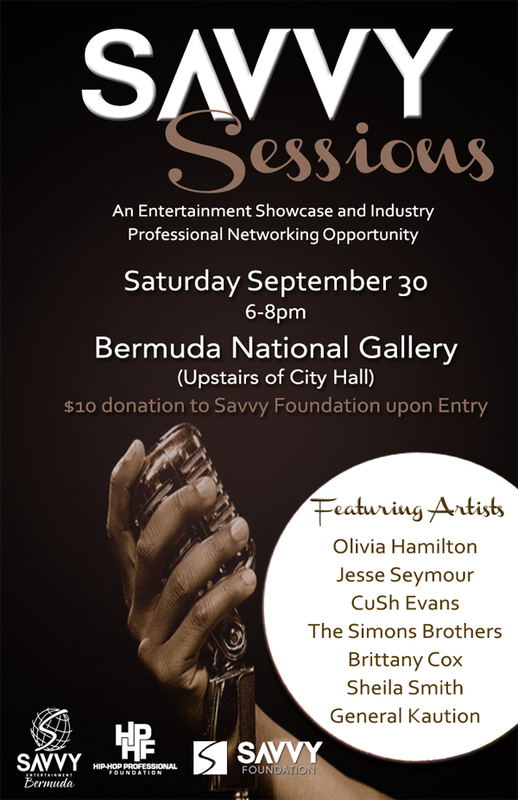 Savvy Sessions provide a platform for artists to showcase their talent in front of a small audience and music industry professionals from around the world. “A handful of local talent has been selected for an intimate listening showcase for Ms. Das and Sony songwriter Anthony Blakey. The pair will be giving advice about their craft and career progression.